The Franschhoek Wine Route lies in Franschhoek Valley. 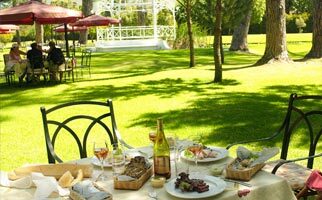 The Franschhoek valley was first settled over 300-years ago by the French Hugenots and the many guesthouses, streetside cafes and award winning restaurants demonstrate a truly French flair. Lying against the backdrop of the majestic Franschhoek and Drakenstein mountains, the town with its picturesque main street showcases antique stores and art galleries rubbing shoulders with bakeries and the chocolaterie. The town of Franschhoek, The centre of the Franschhoek Wine Route, is also home to many festivals - from the annual Bastille Day festival to cheese, wine and olive festivals at various times throughout the year. 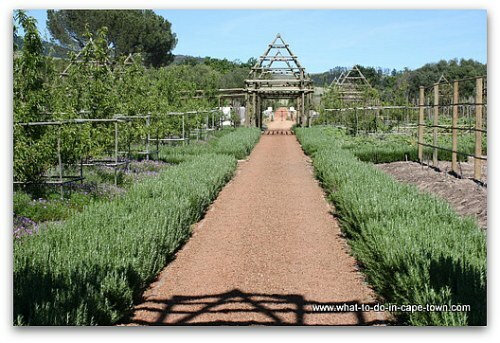 Babylonstoren is one of the best preserved farm yards in the Cape Dutch tradition. The manor house from 1777, the Koornhuis (for storing wheat and hay) and the old cellar are all still in good condition. 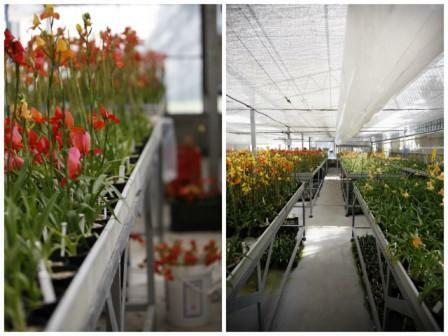 Although on the Franschhoek Wine Route, the farm is however more well-known for its garden which was inspired by the Company Garden, where ships could replenish fruit and vegetables. Every one of over 300 varieties of plants in the eight hectare garden is either edible or has a medicinal value and grown as biologically as possible. 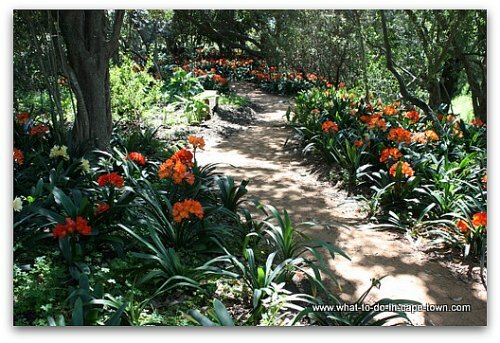 During spring, 7 000 clivias bloom down by the stream, where a secluded path runs in the shade of wild olives and oaks. Accommodation - Guest suites were built in the Cape Dutch style where outer walls are whitewashed and decorated with ornate gables and thatched roofs. Restaurant - At Babel food leans towards simplicity and is made with the vegetables and fruit gathered daily from the garden. Boschendal Wine Estate is one of the oldest wine producers on the Franschhoek Wine Route. Boschendal means "wood and dale". The Manor is one of the most imposing farmhouses in the Cape. It is a typical H-shaped house and is one of the few authentically furnished farmhouses open to the public. 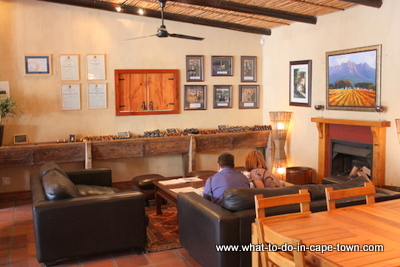 Visitors to the estate are able to taste and purchase wines at the Taphuis Wine Tasting Centre. Haute Cabriere is a wine farm steeped in history and local lore and has been part of the Franschhoek Wine Valley for over 300 years. In 1982, the vineyards were replanted in the tradition of the Champagne. Today the farm specialises in a range of champenoise which have been named after the original Cabrière founder, Pierre Jourdan. Every Saturday Achim von Arnim and his son, Takuan, treat guests to the ultimate in wine theatre. 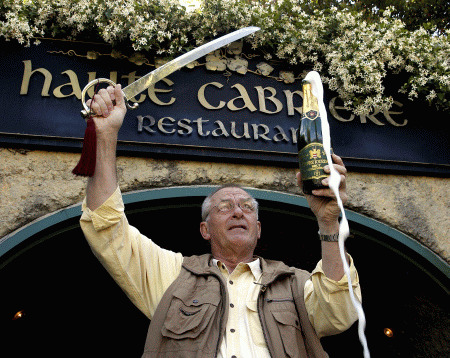 The famed French cavalry sabre is used to open the bottles of Pierre Jourdan Cap Classique. 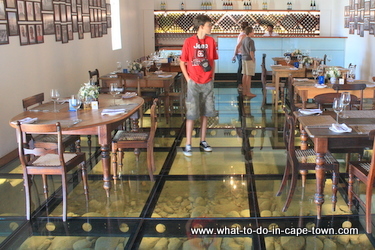 This cellar-style restaurant is built into the hill that overlooks the Franschhoek Valley. Back to top of Franschhoek Wine Route page. The Restaurant and wine-tasting area of Grande Provence project an industrial presence with its steel joinery, galvanised metals and modern skylights. 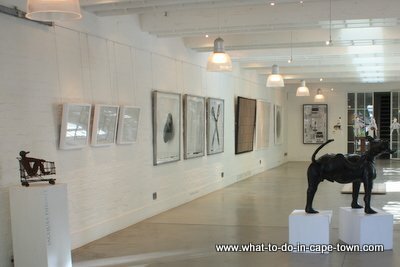 The Gallery is a leading location for contemporary South African art. 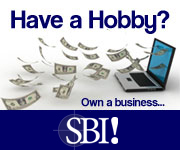 A shop provides an opportunity to purchase works by the artists. La Motte boasts four national monuments: the Manor House (1751), Jonkershuis (1751), Historical Cellar (1782) and the Water Mill (1741). Visitors are able to sample La Motte's range of award-winning wines amid original works of art by acclaimed South African artist Jacob Hendrik Pierneef. All this is done on handmade tasting tables or on the sofas wth a view over the maturation cellars. La Motte purchased the world's largest private collection of disas and today it is the only wine farm to boast such a unique collection. Farming activities include ethereal oil, which are obtained from oil-producing plants such as lavandine, rose geranium, Cape snow bush and buchu. 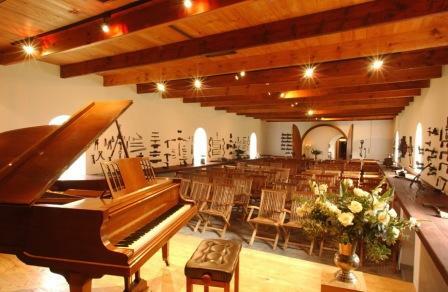 Monthly classical concerts are held in the magnificently restored historic cellar. Rickety Bridge Wine Estate has a winemaking history dating back to the 17th century. The flagship wine range, Paulina's Reserve, bears the name of original owner, Paulina de Villiers. These wines, as well as the Estate's classic range, have received several accolades at wine shows around the world. 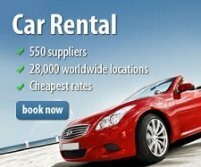 Accommodation is provided in Rickety Bridge Manor House, a renovated 19th century guest house and Basse Provence Country House, a four star sister property to Rickety Bridge. At The Restaurant in the Vines you can sit on the deck or laze on the lawn and enjoy a picnic. Led mainly by farm residents, farm tours offer personal insight into the vineyards, farm workers and cultural and musical heritage of this estate.